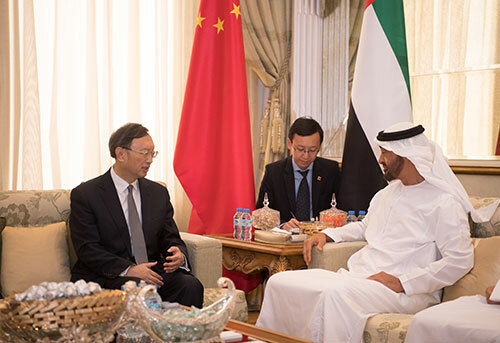 On January 14, 2019 local time, Special Representative of President Xi Jinping, Member of the Political Bureau of the Central Committee of the Communist Party of China (CPC) and Director of the Office of the Foreign Affairs Commission of the CPC Central Committee Yang Jiechi met with Crown Prince of Abu Dhabi Mohamed bin Zayed Al Nahyan of the United Arab Emirates (UAE) in Abu Dhabi. Yang Jiechi conveyed to Mohamed bin Zayed Al Nahyan the warm greetings from President Xi Jinping to President Khalifa bin Zayed Al Nahyan and Crown Prince himself. Yang Jiechi expressed that President Xi Jinping paid a state visit to the UAE last year, which was of historic significance. The main purpose of my visit this time is to implement the important consensus reached by President Xi Jinping and Crown Prince. The Chinese side is willing to make joint efforts with the UAE side to maintain the momentum of close high-level exchanges between the two countries and further tighten the bond of China-UAE relations. Both sides enjoy smooth progress in cooperation on important projects under the framework of the joint construction of the Belt and Road Initiative. The Chinese side will work closely with the UAE side, well arrange the work of overall coordination, and make sure that relevant cooperation projects will achieve more substantial results, in a bid to benefit the two countries and the two peoples. The Chinese side stands ready to strengthen anti-terrorism cooperation with the UAE side and well safeguard common interests of both sides. Mohamed bin Zayed Al Nahyan asked Yang Jiechi to convey the sincere greetings from President Khalifa bin Zayed Al Nahyan as well as himself to President Xi Jinping, and expressed that President Xi Jinping's state visit to the UAE last year elevated bilateral cooperation to new stages. The UAE side is ready to, together with the Chinese side, well implement the consensus reached by the leaders of the two countries, and take the joint construction of the Belt and Road Initiative as an opportunity to deepen cooperation in various areas and strengthen communication and coordination in international affairs, so as to push bilateral comprehensive strategic partnership for constant and in-depth development. The UAE side supports the Chinese side's efforts in anti-terrorism and measures to maintain stability. Strengthening anti-terrorism cooperation between both sides is conducive to promoting regional security and stability.